Background: Recent studies have shown that similar host glycan antigens are expressed by helminths such as Echinococcus granulosus hydatid cysts to evade from host immune system. In this work to investigate these antigens further, immunological cross-reactivity between human sera and hydatid cyst wall antigens has been investigated. Materials and Methods: Hydatid cyst wall antigens were used in enzyme-linked immunosorbent assay and Western immunoblotting and probed with pooled sera of hydatidosis patients and healthy controls. Sodium metaperiodate treatment was used to investigate glycan antigens. Results: A band with molecular weight about 53 KDa reacted with both hydatid patients' sera and also normal human sera. It has been shown that this band was a glycan antigen. Conclusions: A 53 KDa glycan antigen of hydatid cyst wall that reacted with all human sera may have an important role for evasion from host immune system. Hydatid cyst in humans happens as a result of infection with the larval stage of the Echinococcus granulosus. In the life cycle of the parasite, canines play the role of definitive host, and usually, herbivores or omnivores are intermediate hosts. Hydatidosis is one of the most important zoonotic diseases in the world. The highest incidence of human and animal echinococcosis is seen in the temperate zones including South America, the Mediterranean region, Central Asia, China, Australia, and parts of Africa., The anatomical shape of hydatid cyst which is the larval stage of the parasite is a single fluid-filled cyst. The cyst wall is composed of two layers, inner layer or germinal layer and the outer layer or laminated layer., Laminated layer is directly contacts with host tissues, so it seems that plays an important role in host-parasite interactions. This layer is a large extracellular matrix that made of mucin with much of O-glycan glycoproteins., This carbohydrate-rich layer is known also as a “glycocalyx." It has been shown that glycan determinants of hydatid cyst can regulate the host immune response and therefore may affect the course of infection. Worms' ability to regulate the host immune system is a major cause of their long life, for example, protoscolex of E. granulosus can be alive up to many years in hydatid cyst of humans., It seems that the immune response regulation is beneficial for both the human host and the parasite.,E. granulosus with two mechanisms can regulate the responses of the immune system: (1) inactive evasion (parasite remains safe from the harmful effects of the immune system with growing in a cyst) and (2) regulation of the immune system (the parasite has been actively interacted with the host immune system to reduce its effect)., It has been shown that glycans produced by helminths are used to regulate the host immune system., As an example, both schistosome and nematode helminth glycans are largely responsible for altering the immune response toward Th2-type. Furthermore, it has been shown that most of the monoclonal antibodies generated against schistosome antigens recognized glycan epitopes, including Lewis x-containing structures. Moreover, there are strong evidence indicting that glycans rather than protein antigens direct the immune response to helminths. Recent studies have shown that similar host glycan antigens that are expressed by more helminths are identified by dendritic cells (DCs) through the lectin receptors., The helminths use “Glycan Gimmicky” to target DCs (one of the most important antigen-presenting cells) to regulate T-cell to anti-inflammatory responses. “Glycan Gimmicky” in helminths is said to use active strategies to target host glycan-binding proteins to survive for a long time., In the cell surface of DCs, there is one group of receptors, called C-type lectin receptors (CLRs) which identify pathogens' motif glycan. Both the stimulation and modulation of the host immune system by helminths are determined by DC populations. DCs display on their surface different kinds of CLRs. Regarding important role of laminated layer of hydatid cyst in host-parasite interaction, particularly in regulation of the host immune response  in this study, immunological reaction of hydatid cyst wall antigens with different host sera has been investigated. In this descriptive research, the study population consisted of sera of either patient with hydatidosis or normal human sera. To prepare the antigens, liver and lung hydatid cyst of sheep was collected from Khomeini Shahr slaughterhouse in Isfahan, Iran. At the first, the hydatid cyst fluid aspirated with a syringe and checked under the microscope for the presence of protoscolices. Following observation of the protoscolices, the cyst was included in the study. Afterward laminate and germinal layers were separated with a forceps, homogenized, sonicated in phosphate-buffered saline (PBS), centrifuged, and the supernatant stored at 20 as hydatid cyst wall antigen. Glycoprotein of this antigen was purified by chloroform-methanol extraction of glycolipid and glycoprotein. Normal sera (n = 20) and hydatidosis sera (n = 20) were collected from different hospitals in Isfahan Iran. 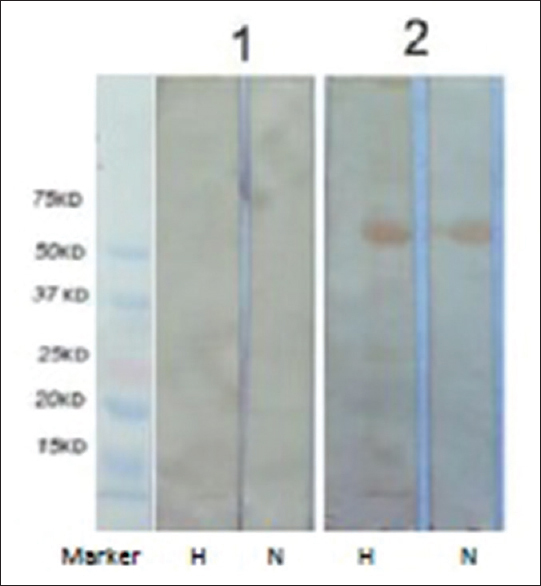 Enzyme-linked immunosorbent assay (ELISA) was performed as we published before. Briefly, ELISA plate was coated with crude cyst wall antigen or purified glycoproteins. The antigen-coated plates were washed three times in washing buffer and then incubated for 1 h with blocking buffer and again washed three times. Hydatidosis patients' sera or normal human sera, diluted in incubation buffer, were added. Plates were washed, and a relevant enzyme conjugated was added. After incubation for 2 h, the substrate 2,2'-azino-bis (3-ethylbenzthiazoline-6-sulfonic acid) was added, and the reaction was read in a spectrophotometer at 414 nm. Sodium dodecyl sulfate polyacrylamide gel electrophoresis (SDS PAGE) was performed for antigens on 12% acrylamide gel under reducing and nonreducing conditions using Bio-Rad mini gel instrument. The gels were either stained with Coomassie blue or transferred to nitrocellulose papers (NCP) using Bio-Rad apparatus. The papers were then probed with different sera at appropriate concentrations. Following washing with the buffer, the paper was probed with a secondary antibody against human IgG. Finally, appropriate substrate was added to develop reaction of sera with the bands of antigens. To inactivate glycan epitopes on NCP, the membranes were treated with 20 mM sodium periodate in 0.1 Mm sodium acetate and then incubated with 50 mM sodium borohydride in PBS prior probing with the antisera. This study was approved by the Ethics Committee of Isfahan Medical University, and sample collection was obtained with a written informed consent of patients and healthy controls. Results of ELISA test showed that both sera of patients with hydatid cyst and also normal human sera reacted with hydatid cyst wall antigens, but mean optical density of patients' sera was higher than that of normal sera [Table 1]. In Western immunoblotting, hydatid cyst wall runs under reducing and nonreducing conditions and probed with the sera of patients with hydatid cyst or normal human sera. Because in reducing condition, more bands were detectable, the experiments were carried out only in reducing condition. In reducing conditions, sera of patients with hydatid cyst and normal human sera reacted with some bands of the hydatid cyst wall. However, the reaction of sera of hydatid cyst patients was stronger than reaction of normal sera [Figure 1]. To check if reactivity of sera with hydatid cyst wall antigens related to carbohydrate epitopes, cyst wall antigen runs on SDS PAGE and transferred on NCP membrane. The paper was then cut into two halves. One half was treated with sodium metaperiodate and the other half left intact, and then, normal Western blotting was continued with hydatid cyst patients' sera or normal human sera. Following sodium metaperiodate treatment, all bands including a 53 KDa band that has the highest reaction with our sera were removed [Figure 2]. The results of this study demonstrated that both hydatidosis and normal human sera reacted with hydatid cyst wall antigens and also it was shown that these antigens are glycosylated antigens. Hence, it can be concluded that hydatid cyst wall crude antigen is not a suitable antigen for immunodiagnosis of hydatid cyst. In immunology of helminths' infection, it has been shown that the mechanisms of host immune system are not able to clear chronic infections,, and carbohydrate epitopes of helminths may play a role in this regard. Considering the importance of glycan in helminths immunology, in this work, antibody response to hydatid cyst, especially glycosylated antigens, has been investigated. It seems that laminated layer of E. granulosus plays an important role in host-parasite interactions., A number of antigens, including many glycoproteins, are produced by the metacestode of E. granulosus that can regulate host immune system. Furthermore, it has been shown that removal of the whole N-glycan of hydatid cyst causes a dramatic loss of immune reactivity. Glycans are abundant on the surfaces of helminths and within their secreted antigens. Several studies show that recognition of pathogen-associated and host-like glycan antigens expressed by many helminths can interfere with the production of effective immune responses., The ability of helminths to induce chronic infection may be beneficial both for the hosts and the parasites. For instance, “Glycan Gimmicky” of helminths may be useful for host. In our work, a 53 KDa glycan antigen of hydatid cyst wall that cross-reacted with normal human sera may have an important role for E. granulosus evasion from human immune system. Probably, the parasite produces this antigen to make the host produce antiglycan antibodies to block the site of effective antibodies such as IgE (blocking antibodies)., In an investigation, sera of patients with hydatid cyst reacted with several bands of cyst wall in Western blotting. In another work, cross-reaction of sera of patients with breast cancer with a 27 KDa antigen of hydatid cyst wall has been shown. This band was sodium periodate-resistant antigen indicating that it was not a glycosylated antigen. However, none of the above-mentioned bands reacted with normal human sera.Hydatid cyst wall can allow antigens up to 150 KDa diffuse to host tissues. Hence, it is possible that 53 KDa antigen of hydatid cyst wall usually diffuses out to host tissue to regulate the immune system toward a nondestructive response. In agreement with our result, involvement of interleukin (IL10) and IL4 in evading of hydatid cyst from host immune response has been shown. In another work, possible role of the parasite antigen B in evasion from the host immune response has been suggested. Furthermore, complement evasion by E. granulosus hydatid cyst has been suggested. Mechanisms of escaping parasite from immune system are sophisticated aspects of the host–parasite relationship. Hence, further investigation is recommended to find the exact role of hydatid cyst glycan antigens which cross-react with normal human serum and their involvement in evasion of the parasite from host immune response. 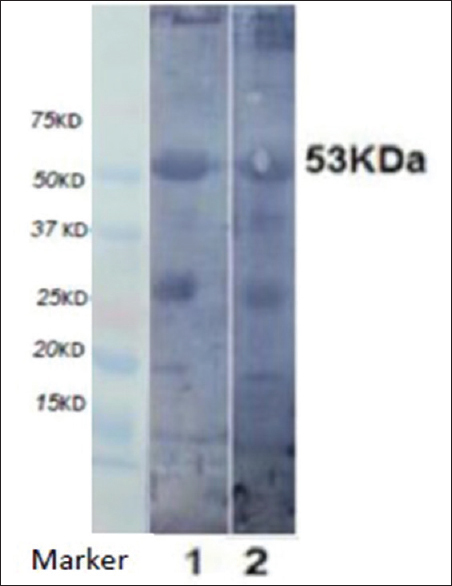 In this work it has been shown that a 53 KDa glycan antigen of hydatid cyst wall reacted with all human sera. So this antigen may have an important role for evasion from host immune system. This work supported by grant from Isfahan University of Medical Sciences. Moro P, Schantz PM. Echinococcosis: A review. Int J Infect Dis 2009;13:125-33. Nakao M, McManus DP, Schantz PM, Craig PS, Ito A. A molecular phylogeny of the genus Echinococcus inferred from complete mitochondrial genomes. Parasitology 2007;134:713-22. Atkinson JA, Williams GM, Yakob L, Clements AC, Barnes TS, McManus DP, et al. Synthesising 30 years of mathematical modelling of Echinococcus transmission. PLoS Negl Trop Dis 2013;7:e2386. Eckert J, Deplazes P. Biological, epidemiological, and clinical aspects of echinococcosis, a zoonosis of increasing concern. Clin Microbiol Rev 2004;17:107-35. Grosso G, Gruttadauria S, Biondi A, Marventano S, Mistretta A. Worldwide epidemiology of liver hydatidosis including the Mediterranean area. World J Gastroenterol 2012;18:1425-37. Lin G, Todeschini AR, Koizumi A, Neves JL, González H, Dematteis S, et al. Further structural characterization of the Echinococcus granulosus laminated layer carbohydrates: The blood-antigen P1-motif gives rise to branches at different points of the O-glycan chains. Glycobiology 2013;23:438-52. Zhang W, Wen H, Li J, Lin R, McManus DP. Immunology and immunodiagnosis of cystic echinococcosis: An update. Clin Dev Immunol 2012;2012:101895. Gottstein B, Hemphill A. Echinococcus multilocularis: The parasite-host interplay. Exp Parasitol 2008;119:447-52. Díaz A, Fontana EC, Todeschini AR, Soulé S, González H, Casaravilla C, et al. The major surface carbohydrates of the Echinococcus granulosus cyst: Mucin-type O-glycans decorated by novel galactose-based structures. Biochemistry 2009;48:11678-91. Hülsmeier AJ, Deplazes P, Naem S, Nonaka N, Hennet T, Köhler P. An Echinococcus multilocularis coproantigen is a surface glycoprotein with unique O-gycosylation. Glycobiology 2010;20:127-35. Míguez M, Baz A, Nieto A. Carbohydrates on the surface of Echinococcus granulosus protoscoleces are immunodominant in mice. Parasite Immunol 1996;18:559-69. Cardozo G, Tucci P, Hernández A. Characterization of the immune response induced by a carbohydrate enriched fraction from Echinococcus granulosus protoscoleces in patients with cystic hydatid disease. Parasitol Res 2002;88:984-90. Behnke JM, Barnard CJ, Wakelin D. Understanding chronic nematode infections: Evolutionary considerations, current hypotheses and the way forward. Int J Parasitol 1992;22:861-907. McSorley HJ, Maizels RM. Helminth infections and host immune regulation. Clin Microbiol Rev 2012;25:585-608. Maizels RM, Yazdanbakhsh M. Immune regulation by helminth parasites: Cellular and molecular mechanisms. Nat Rev Immunol 2003;3:733-44. Zhang W, Ross AG, McManus DP. Mechanisms of immunity in hydatid disease: Implications for vaccine development. J Immunol 2008;181:6679-85. Zhang W, Li J, McManus DP. Concepts in immunology and diagnosis of hydatid disease. Clin Microbiol Rev 2003;16:18-36. Hewitson JP, Grainger JR, Maizels RM. Helminth immunoregulation: The role of parasite secreted proteins in modulating host immunity. Mol Biochem Parasitol 2009;167:1-11. Oriol R, Williams JF, Pérez Esandi MV, Oriol C. Purification of lipoprotein antigens of Echinococcus granulosus from sheep hydatid fluid. Am J Trop Med Hyg 1971;20:569-74. Thomas PG, Harn DA Jr. Immune biasing by helminth glycans. Cell Microbiol 2004;6:13-22.
van Die I, van Liempt E, Bank CM, Schiphorst WE. Interaction of schistosome glycans with the host immune system. Glycobiology and Medicine. London, Springer; 2005. p. 9-19. Nyame AK, Kawar ZS, Cummings RD. Antigenic glycans in parasitic infections: Implications for vaccines and diagnostics. Arch Biochem Biophys 2004;426:182-200.
van Liempt E, van Vliet SJ, Engering A, García Vallejo JJ, Bank CM, Sanchez-Hernandez M, et al. Schistosoma mansoni soluble egg antigens are internalized by human dendritic cells through multiple C-type lectins and suppress TLR-induced dendritic cell activation. Mol Immunol 2007;44:2605-15. Harn DA, McDonald J, Atochina O, Da'dara AA. Modulation of host immune responses by helminth glycans. Immunol Rev 2009;230:247-57.
van Die I, Cummings RD. Glycan gimmickry by parasitic helminths: A strategy for modulating the host immune response? Glycobiology 2010;20:2-12. Merad M, Manz MG. Dendritic cell homeostasis. Blood 2009;113:3418-27. Everts B, Smits HH, Hokke CH, Yazdanbakhsh M. Helminths and dendritic cells: Sensing and regulating via pattern recognition receptors, Th2 and Treg responses. Eur J Immunol 2010;40:1525-37. Figdor CG, van Kooyk Y, Adema GJ. C-type lectin receptors on dendritic cells and Langerhans cells. Nat Rev Immunol 2002;2:77-84. Díaz A, Casaravilla C, Allen JE, Sim RB, Ferreira AM. Understanding the laminated layer of larval Echinococcus II: Immunology. Trends Parasitol 2011;27:264-73. Darani HY, Doenhoff MJ. Anomalous immunogenic properties of serine proteases. Scand J Immunol 2009;70:384-8. Allen JE, Maizels RM. Diversity and dialogue in immunity to helminths. Nat Rev Immunol 2011;11:375-88. Oikonomopoulou K, Brinc D, Kyriacou K, Diamandis EP. Infection and cancer: Revaluation of the hygiene hypothesis. Clin Cancer Res 2013;19:2834-41. Andrade MA, Siles-Lucas M, Espinoza E, Pérez Arellano JL, Gottstein B, Muro A. Echinococcus multilocularis laminated-layer components and the recombinant protein decrease NO production by activated rat macrophages in vitro. Nitric Oxide 2004;10:150-5. Paschinger K, Gonzalez-Sapienza GG, Wilson IB. Mass spectrometric analysis of the immunodominant glycan epitope of Echinococcus granulosus antigen Ag5. Int J Parasitol 2012;42:279-85. Khoo KH, Dell A. Glycoconjugates from parasitic helminths: Structure diversity and immunobiological implications. The Molecular Immunology of Complex Carbohydrates – 2. Taiwan: Springer; 2001. p. 185-205. Meyer S, Tefsen B, Imberty A, Geyer R, van Die I. The C-type lectin L-SIGN differentially recognizes glycan antigens on egg glycosphingolipids and soluble egg glycoproteins from Schistosoma mansoni. Glycobiology 2007;17:1104-19. Hisaeda H, Yasutomo K, Himeno K. Malaria: Immune evasion by parasites. Int J Biochem Cell Biol 2005;37:700-6. Hussain R, Poindexter RW, Ottesen EA. Control of allergic reactivity in human filariasis. Predominant localization of blocking antibody to the IgG4 subclass. J Immunol 1992;148:2731-7. Hadipour M, Nazari M, Sanei B, Ghayour Z, Sharafi SM, Yazdani H, et al. Immunological diagnosis of human hydatid cyst using Western immunoblotting technique. J Res Med Sci 2016;21:130. Sharafi SM, Rafiei R, Hadipour M, Shirzad H, Khanahmad H, Darani HY. A nonglycosylated 27 kDa molecule as common antigen between human breast cancer and Echinococcus granulosus hydatid cyst wall. Adv Breast Cancer Res 2016;5:90. Gottstein B, Hemphill A. Immunopathology of echinococcosis. Chem Immunol 1997;66:177-208. Amri M, Mezioug D, Touil-Boukoffa C. Involvement of IL-10 and IL-4 in evasion strategies of Echinococcus granulosus to host immune response. Eur Cytokine Netw 2009;20:63-8. Virginio VG, Taroco L, Ramos AL, Ferreira AM, Zaha A, Ferreira HB, et al. Effects of protoscoleces and AgB from Echinococcus granulosus on human neutrophils: Possible implications on the parasite's immune evasion mechanisms. Parasitol Res 2007;100:935-42. Díaz A, Ferreira A, Sim RB. Complement evasion by Echinococcus granulosus: Sequestration of host factor H in the hydatid cyst wall. J Immunol 1997;158:3779-86.